This is a Sponsored post written by me on behalf of Libby’s. All opinions are 100% mine. Happy Spring! Do you find that you only eat certain foods at specific times of the year even though you really love them and their available year round these days? For example, during the spring I love fresh asparagus and brussesls sprouts. However, I love pumpkin, in more than just pie, but I only seem to eat it during the fall months even though it’s deliciously available canned all year long. It’s of course great in desserts, but also breads, pancakes, smoothies and even savory dishes. I just love the beautifully vibrant color of Libby’s pumpkin! It’s also quite the healthy superfood with benefits like being a good source of fiber and a great source of Vitamin A, which promotes healthy eye development. Not to mention you can use it to reduce both fat and calories in recipes by using it as a substitute for things like oil and butter. It’s also super easy to add to things like sauces, even store bought, smoothies and stews for extra flavor depth and nutrition. So, why do I not use pumpkin more throughout the year? Honestly, I don’t know, but there are certainly plenty of reasons that I am going to start because of what Pumpkin Can do. 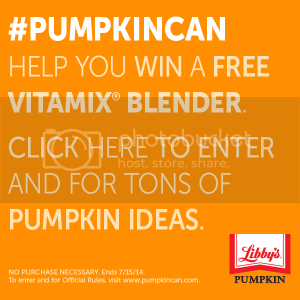 The #PumpkinCan contest has a fantastic prize to help you get cooking! I decided to start with a dish that Mr. Savvy and I both really enjoy eating throughout the year, pasta. I immediately thought that pumpkin would pair deliciously with sausage and sage. Add in some cream and other pumpkin-friendly flavors with pasta and you can’t really go wrong, right? 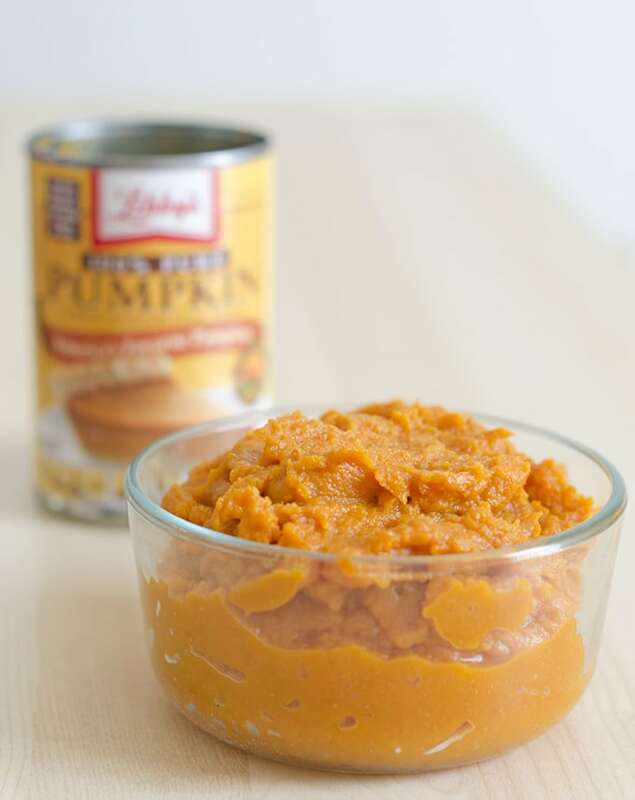 So, I headed to the store and bought some of my favorite ingredients, including the pumpkin brand I always use,Libby’s Pumpkin. The nice thing is that the meal was actually ready in under an hour, so it’s even a great weeknight meal that usually natural ingredients. I used a good bit of spice in this pasta recipe, but if you don’t like things spicy you can of course use sweet sausage and leave out the red pepper. I like using sausage in the casing and then cutting it into chunks so you can have nice meaty pieces of sausage running throughout the pasta. You can also of course use whatever pasta you prefer, but I really like the rigatoni because the sauce can seep in and really hang onto the pasta. Lastly, you can leave the wine out if you prefer, just substitute more chicken broth. I love the color of this sauce, it almost looks like a red curry. The resulting dish is definitely pure comfort food. It was honestly quite nice of a change to have pasta that was creamy with a spicy kick, but not super cheesy and without a tomato in sight. Mr. Savvy honestly wasn’t too sure about my creation idea when I first mentioned it, but he went back for seconds, so I guess he liked it okay. ;) I found the pasta to be very filling on its own, but it’s also great with bread and/or salad. Now let’s get on to the good stuff! 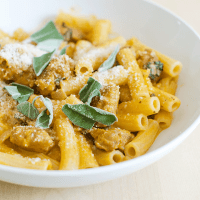 You'll love eating this rigatoni with spicy pumpkin and sausage sauce all year long! Heat a large and deep skillet over medium-high heat for a few minutes. In the meantime, put a large pot of water on to boil for pasta. Add in about a tablespoon of olive or other cooking oil and swirl to coat pan. Add in Italian sausage and cook until browned and cooked through. Remove sausage from pan onto paper towel lined dish to drain. If you have more than a tablespoon or 2 of grease left in the skillet, drain the excess. Turn heat to medium and add in the chopped onion and cook for about 1 minute and then stir in the garlic and red pepper. Cook until onion is softened, about 3 -4 more minutes. Add in 6 chopped sage leaves and white wine and cook for about 2 minutes until white wine has reduced by about half. In the meantime, start boiling pasta. After wine has reduced, add in the broth, pumpkin and spices. Heat until it starts lightly bubbling. 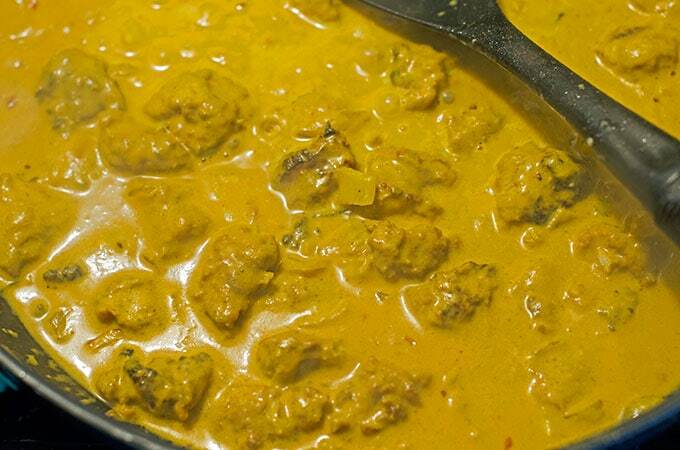 Stir in the cream and simmer for 7 - 10 minutes, until sauce has thickened. Season sauce to taste with salt and pepper and add in cooked and drained pasta, tossing to coat. Serve immediately, with cheese, chopped sage and extra pepper flakes for garnish. Store leftover in air-tight container in refrigerator for up to 3 days. 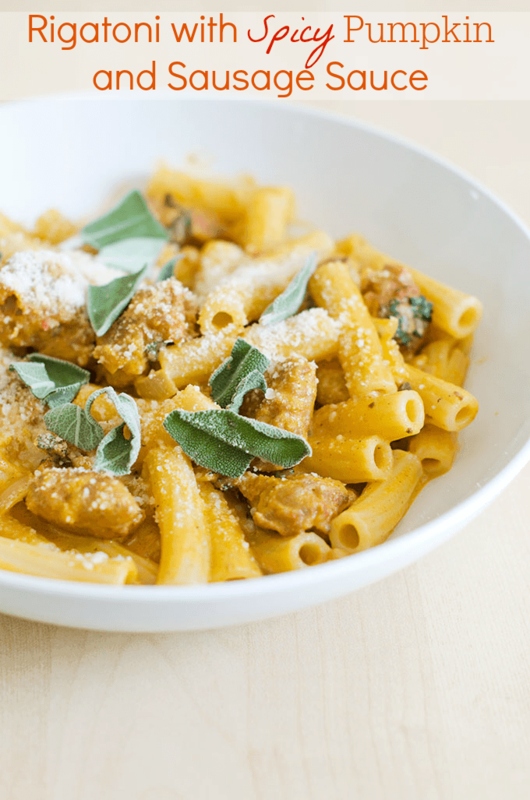 Experiment with different pastas, sausage flavors and spices to change things up! As much as I love pumpkin I’ve never tried to cook with meat before but I keep hearing abut rigatoni with pumpkin. After reading this post I definitely will be giving it a whirl on our next menu plan. Thanks! That looks SO yummy! I love Libby’s pumpkin! 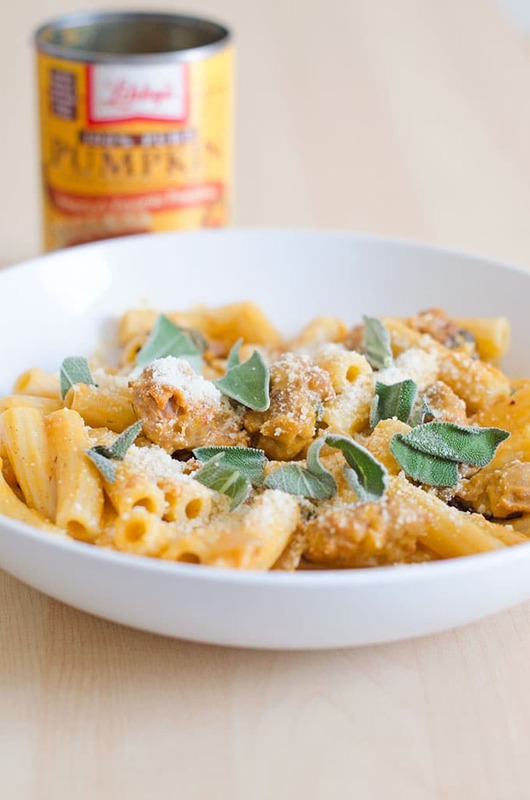 That looks so dang good, and I wouldn’t have ever thought of using pumpkin in a pasta dish. Oh man that looks so good! I never thought to make a pumpkin sauce for pasta. I don’t think that I’ve ever had a pumpkin-based sauce with pasta before, but I definitely want to try it now! Yum! Wow, that looks delicious! I nev would have thought to use pumpkin but that sounds really good! What an interesting combination but it looks really yummy! I honestly never thought about adding pumpkin to a pasta sauce. The recipe sounds really good though and I think I might just give it a try! This looks really good! Add some gluten free pasta and you’ve got a winner.